Finishing DIY home automation systems is a reward in itself. Sure, anyone can call a professional to install a system, but then can the DIYer brag about how he or she automated their home? More importantly, doing the job yourself gives you insight into how it works. This means that when problems happen (and they will) you can track down a solution yourself. That can save you big bucks in calling a repairman. Here are 10 DIY Home automation systems you will want to look at. This DIY system by Vera is compatible with products that use Wi-Fi, ZigBee and Z-Wave home control technologies. Their hub can control up to 200 devices and is great for remote access. Vera’s home automation system’s software connects with any web browser, as well as the Android, iOS and Windows Phone smartphone app. The only notable downside to Vera is the fact that it does not have voice command capability or offer any compatibility with home theaters. Livewatch is a security company that made the natural progression into offering its services for home automation. Using their equipment, you can add smart plugs, light switches, smart locks and thermostats to your system. Next, comes the system by Wink. It is an interesting plug and play system that you can use with any Wi-Fi, Bluetooth, Zigbee, or Z-wave piece of hardware. The great thing about it is that you can add most types of smart home to the Hub making it a good choice for DIYers. You have your choice of three kits that are aimed at security, lighting, and convenience. That is good if you are wanting to home automate in specific directions, but not so good if you are looking for a blend of the three. Going on there is, Homeseer, which gives you a DIY home automation system that you can customize to create programs that range from simple or extremely complex. You can manually or by using voice control turn on the lights at random or regular intervals to give your home a lived in look while you are away. Most, if not all home automation systems use Wi-Fi in some way. Whether is control features or to control the items attached to a central hub, wi-fi plays a key role. Almond adds an aspect that the most other DIY home automation systems seem to overlook. Almond, doubles as a router. So for those DIYers that like to use as little electricity or connections as possible, this might be the system for you. For the DIYer that wants a home automation system that leans more towards home security, there is Protect America. You need to purchase a service plan through the company so that might be a downside to the financially conscience DIYer. Protect America DIY home automation systems connect to the Wi-Fi in your home and allows you to add additional smart home products via Z-Wave. 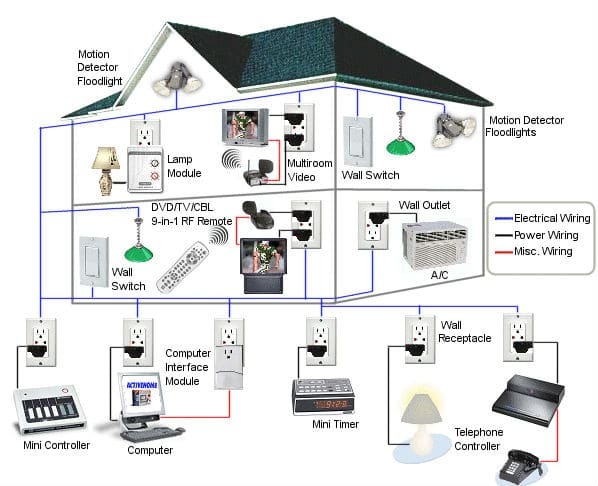 The home automation system by Frontpoint is limited in its depth of DIY home automation systems. It can run a limited array of home automation systems, but it lacks the ability to connect to Bluetooth or ZigBee devices. For the most part, it is great for security cameras and security monitoring and it can turn on or off your lights. But for running a home entertainment center or your romba, this is not the system you are after. Smartthings by Samsung offers a fully configurable device that can easily interface most if not all of your DIY home automation systems needs and desires. With an easy interface, almost anything your heart desires can become part of your home automation system. With Nexia, you can expect basic DIY smart home system functionality. Since it has relatively few features, this is one of the easiest systems to use. However, it doesn’t have a touchscreen option, voice control or wired smart home components. The lack of touchscreen is not a problem since Nexia has mobile apps for Android and iOS. Finally, we have Iris by Lowe’s. This system comes with a good feature set, easy controls, and amazing software compatibility. Despite Iris lacking entertainment integration, it makes up in amazing technical support, plus you can always just go to the nearest Lowe’s store if you need face-to-face assistance. As an added plus instead of buying online, Iris by Lowe’s is one of few DIY home automation systems you can also find in a retail store. In the end, DIYers love to get their hands dirty. They usually do not mind having to think outside the box to achieve their goal of “teching” up their home. However, they usually want value for their effort. That means the system that a DIYer wants is one that is affordable, is durable and is expandable as the house needs change and expand. The right choice of a DIY system can be a rewarding experience to install and use; while a bad choice can haunt the homeowner for years. So in the end, make sure that your choices are made to suit your needs and desires.